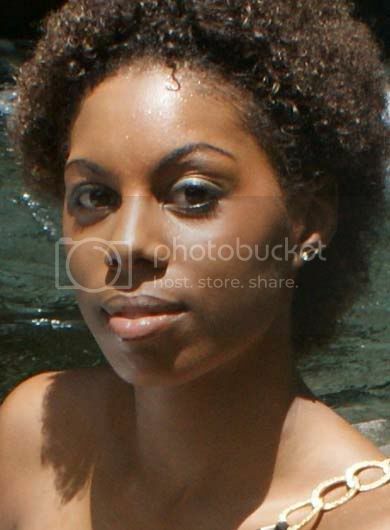 Notes: Mitchelle Malezieu is one of the top 3 finalists in Miss International Guadeloupe 2011 contest. Educating all people of our mother land to build a better future, to change habits and behaviors in our daily lives. Awareness of global warming and climatic catastrophes that threaten mankind. Blessed with the most beautiful beaches in the white sands and a simple lifestyle, friendly people and warm, Guadeloupe the natural beauty, called the island of beautiful waters, or the Emerald Isle is located in the Lesser Antilles. Its tropical forest, known as National Park of Guadeloupe, one of the most beautiful wonders of all the Lesser Antilles that Mother Earth has given us. Heritage deserves to be known. Besides the beautiful beaches and hidden coves, spicy flavors, its rum, sugar cane, his Creole music, traditional houses and small fishing ports ... My island offers a concentrate of the exotic for a vacation out of the ordinary. But I particularly want to represent the Guadeloupian woman, a woman of great beauty with its mixing, pouring, intelligent, generous, self-respecting and respect others, who did not faint of heart, which showed determination to get what she wants. I was very lucky to have a big family. Brothers, (3). Although there were difficult days, my family has always been welded. My mother wanted for lunch and dinner with your family, organize trips and outings. Growing up, they taught me the values of a family, its importance in society. Human kindness and genuine love for all, I thank my parents and other members of my family, always believe in myself and never be afraid to dream. Today I will not have had the opportunity to represent my country at the Miss Earth Pageant. The lesson I learned is that that life does not always go as planned. Two is that everything happens for a reason. Three is that my mother has always been a woman fighter, despite the vagaries of life. This was the day that my parents separated, and the icing on the cake that year my last brother, following an emotional shock becomes diabetic. It was a very sad moment for me and for my mother. Being involved in public relations, I would like to make an educational message of taking responsibility as an attempt to effectively spread the word and remind everyone of our responsibilities. Let me begin by politicians, for the protection of our park, "mangrove" is a real barrier for people in case of tsunami. The micro-wave is scattered by the aerial roots of mangroves. What is more endangered, because of housing and industrial areas. Natural barrier against tsunamis, immense reservoir for biodiversity, "market" for some natural populations, mangroves are in danger. Protection recycling, reforestation and coastal due to cyclones, and storms. The Guadeloupe and other countries of storms, Caribbean hurricane experience in the region annually. So many people are flooded, and residents were left homeless. Even people lose their lives. In areas where many trees were cut down these people experienced overwhelming when it rains heavily. Marine life in our coastal areas is destroyed. This neglect illuminates my country and the world of the importance of trees as they are so precious to our existence, they produce oxygen, and help to minimize flooding, minimize soil erosion caused by natural disasters. They provide food for humans and animals. Tell everyone to be aware, to build a better future for our children.